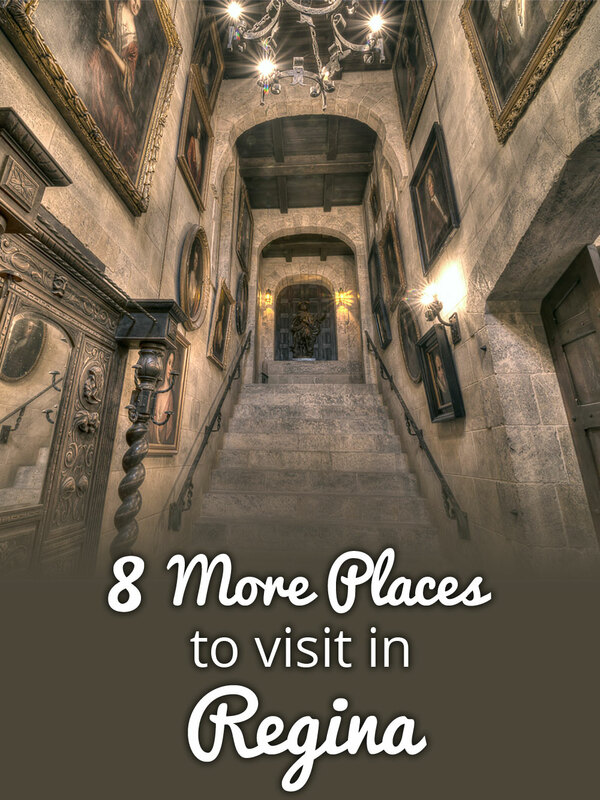 8 More Places to Visit in Regina November 30, 2015 · 19 min. readThis article may contain affiliate links. The house then became Helmings Funeral Chapel until 1977 and in 2003 it was purchased by real estate investor Jason Hall. Mr. Hall saw the potential in reviving the Darke’s dream of a castle on the prairies, and worked with local artisans to make the dream a reality. For the next 12 years Mr. Hall’s project has been kept behind closed doors, until December 1st of this year when people can finally tour this magnificent structure. Inside you will find authentic Renaissance paintings, beautiful Greek stonework, indoor fountains, courtyards, religious motifs and even suites available for rent! Jason Hall isn’t done building his castle yet and still plans to expand his garage into a tower, create a dungeon in the basement and finish his indoor pool. Touring the castle costs $25, but staying at the castle ranges from $1500 to $2000 a night. While the price may seem extravagant, it seems only fair once you see inside this incredible structure and realize it’s a piece of Medieval Europe sitting in the heart of the Queen City. To learn more about this incredible building, check out the article I wrote for Tourism Regina. The year was 1921 when the Four Horseman of the Apocalypse rode into Regina and threw open the doors to the Capitol Theatre, "one of the finest theatres in the Canadian West". The theatre was one of the dozens that were erected throughout downtown Regina which, fueled by the unprecedented growth of Saskatchewan’s economy after World War I, promoted the population of Regina to explode. Nine years later, the world was struck with the Great Depression and Saskatchewan barrelled through the Dirty Thirties. The Forties brought World War II, and the Fifties and Sixties brought in more challenges for the city struggling to reclaim its former status. Nevertheless the Capitol remained a pinnacle of Regina’s once incredible theatre scene. This all ended in 1992 when the Capitol was destroyed. This was the catalyst that threw the art and music industry out of downtown Regina and scattered it throughout the city. A little over twenty years later, the Capitol reopened, but this time as a 1920s Jazz and Tapas bar. Collecting original artifacts from the old theatre, and researching food, music and drinks that were popular during that period, Tim Rogers, Joel Williams, Judd Stachoski, Shawn Dalton and Trevor Maghoo brought the Capitol back to life. Every Tuesday and Saturday they have live jazz, and throughout the year they have their own 1920s themed functions. The Capitol is one of the many incredible restaurants opening up in the area, which is once again breathing life into downtown; much like the original Capitol did nearly a century earlier. Similar to the Capitol and Stone Hall Castle, the Creative City Centre was created because somebody saw inspiration when others saw nothing. Built in 1912, the second and third floors above the Capitol were used for a variety of different purposes, including residential, retail, sewing classes and storage. In 1951 it became used strictly for storage, and then it was forgotten for over half a century. In 2008 the building was in need of major repair. The floor was rotting, the paint was peeling and windows were bricked and boarded up. 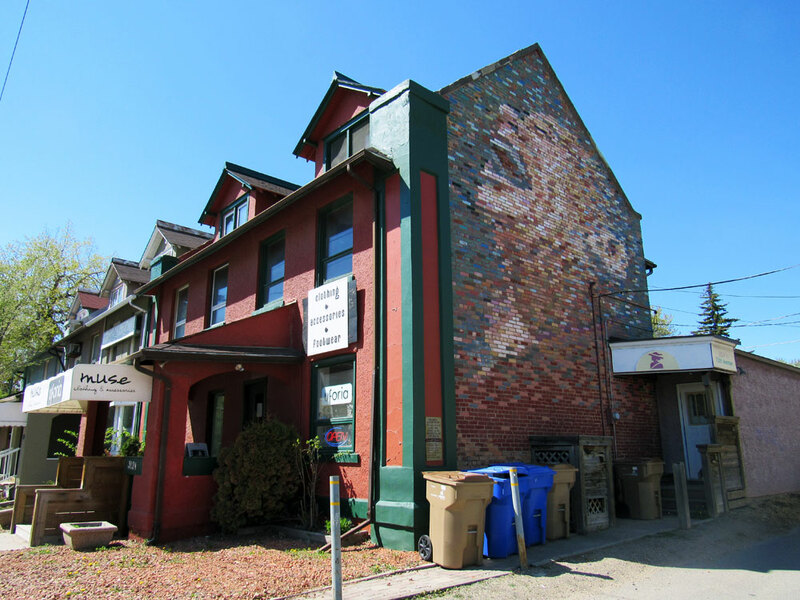 Marian Donnelly saw past this, however, and with a small group of volunteers working over three years, they were able to restore the building and create a brand new performance venue and creative hub, mere blocks from downtown! The Creative City Centre offers workshops, poetry slams, drawing classes, shirt printing and podcasts. They also have an Empty Room series where local musicians can make their own music videos and can be featured on CBC Radio, and The Hague Gallery, a gallery for local artists to display their work. The building is also home to several entrepreneurial companies interested in fashion, art, design and photography, such as Articulate Ink, Jason Cawood & Blair Fornwald, Two Hearts Media and Crushed Rockets. At only three years old, the Creative City Centre is bringing artists of all walks of life together to revitalize the city. Regardless of if you have a lifelong interest in art, or you’re just beginning to express your creative side, the Creative City Centre is the place you need to be! When the first train rolled into Regina in 1882, the Warehouse District (then called the Wholesale District) began popping up. As the population boomed from 6,000 people to 30,000 people from 1906 to 1913, the Warehouse District grew with it. The Warehouse District was the economic hub of the city. While the area was devastated after the Regina Cyclone in 1912, it rebuilt quickly. However, scars can still be seen, such as on the Ackerman Building which still has structural cracks on the side of it after the cyclone ripped the building in half. Bushwakker Brew Pub across the street from the Ackerman Building was built over the remains of a Chinese laundromat that was flatted by the storm, and is said to be haunted by several ghosts. I covered this incredible building in my article "Haunted Jaunts in the Queen City" on Tourism Regina. The district's website says that many businesses, such as John Deere Plow Co., Sears Mail Order, General Motors, and Army and Navy buildings were connected by spur rail tracks which ran between these buildings, easing access to the main rail line. By 1924, there were 22 rail lines radiating from Regina with up to 50 arrivals and departures per day. The Saskatchewan Roughriders’ original stadium, the Dominion Park Stadium, was also in this area. The area now consists of about 500 businesses, varying from web design to cabinet installation to furniture and to food production. Full of incredible architecture, thriving businesses and many trade outlets, the Warehouse District is a combination of the old and the new, a reminder of Regina’s past but also the promise of a bright future. This promise has become even brighter lately with the upcoming city project to unite the Warehouse District with Regina’s Downtown via a pedestrian bridge. This can, for the first time in history, connect the economic center of the city to its banking center, bringing more business to both areas and starting a new era the Warehouse District. Close to the Regina International Airport is the Regina Flying Club, a club that was started in 1927. Currently inhabiting a hanger built to fend off Japanese firebombs in World War II, the 70 year old hanger educates and trains new pilots and allows them the opportunity to become commercial pilots and fly around the world. In November I approached one of pilots and asked to be taken up for a private flight around Regina and area. The view was breathtaking! I wrote a whole article about it, just showcasing the beauty that we saw from above. Immediately after takeoff, I wished we had gone up in the autumn to see the myriad of contrasting colours, but I was pleasantly surprised by what I saw. If you’re interested in seeing Regina from above, or you want to learn how to fly an airplane either as a hobby or a profession, the Regina Flying Club is the place to be! Officially opened on March 1st, 1984, the Saskatchewan Military Museum was the private collection of retired Major C. Keith Inches. Having exponentially grown in the years leading up to its foundation, Major Inches decided it was time to find a permanent place for his collection and was granted room 112 in the Regina Armories in 1991. His collection has only grown since, and now consists of an overwhelming large collection of war memorabilia, including Boar War metals, World War I wooden crosses, World War II "liberated" Nazi items, Cold War artifacts, and recent Afghanistan war memorabilia. Bayonets, swords, uniforms, photographs, parachutes, lifeboats, plaques, tank shells and grenades are some items on display, each with their own personal story of the men and women who served our nation. While the museum is small and very crowded, there is talk of expansion and the museum’s curator, Kristian Peachey, is ecstatic at the possibility. More room would mean larger displays, which could drive more people to visiting the museum. With more people visiting the museum, he could get more manpower and would be able to shift through the growing collection of military relics he has yet to catalogue. Kristian and the Saskatchewan Military Museum have also helped me with my "The Bombing of Saskatchewan" article about the Japanese mission to send 10,000 fire bombs across the Pacific Ocean. Being 110 years old, the Royal Saskatchewan Museum is slightly younger than the city itself. Its story begins on Christmas Day 1905 when Charles Noddings finds a boulder with a face carved into it. Believing correctly that this is an ancient relic from prehistoric times, Noddings donated it to the newly formed Province of Saskatchewan and the idea of a museum to "secure and preserve natural history specimens and objects of historical and ethnological interest" was born. In its beginnings the museum held a variety of very strange pieces, such as old horseshoes, Hindu embroidery, Zulu necklaces, a girdle and shield, Mesopotamia greeting cards, Mexican feather work, a Jamaican hat, one polar bear foot and a boot worn by Captain Scott on the South Pole expedition. Slowly the museum moved away from collecting obscure items and focused more on Saskatchewan-oriented artifacts. The museum has moved several times since its conception, with the last place being the Normal School in 1944. With the failed construction of the stunning Chateau Qu'Appelle on the corner of Albert Street and College Avenue, and the building of Hotel Saskatchewan closer to downtown, the lot became the perfect place for the Royal Saskatchewan Museum and in 1955 it finally found its permanent home. Today the museum offers incredible exhibits focused on Saskatchewan’s natural history. One section of the museum focuses on the wide variety of wildlife that has existed here, such as the undersea dinosaur, the Mosasaur, which was an incredible 10 meters (32 feet) long. Other dinosaurs also strolled throughout the province, such as the Triceratops, the Edmontosaurus and everybody’s favorite dinosaur, the Tyrannosaurus rex! The T. Rex is so popular in fact that the Museum even has its own "living" replica on display named Mega Munch! A treat for kids, the Mega Munch exhibit is everybody’s favorite at the Museum. After the extinction of the dinosaurs, large mammals dominated the area, such as Mastodons, Rhinoceros-like brontotheres and three toed horses that were the sizes of dogs. Three million years later, the world cooled drastically and massive sheets of ice ripped up the province, digging deep trenches across the otherwise barren plain. Animals had to change to adapt, and the once savannah oriented animals were replaced by more winter oriented animals such as lynx, cougars, caribou and moose. The museum then discusses humanities presence in the province, starting with the Aboriginals and their cultures and customs, contact with Europeans and the global climate crisis. The museum is a treat for young and old, and offers an incredible glimpse into the history of our province. Just west of the shadow of Regina’s rapidly growing skyline is Cathedral Village, the artistic heartbeat of the city. A trip through the area will showcase scores of building size murals, unique art and quirky shops, along with impeccable restaurants like Table 10, the Mercury and the Cathedral Village Free House. This area of Regina is one of the best places to experience Regina’s apparent "non-existent" artistic side that many visitors claim the city lacks. The area is also home to the Artesian, a gorgeous performance venue on 13th Avenue. The venue has all sorts of functions going on inside it, such as plays, philosophical discussions, improve, comedy shows, dance parties and much more on an almost nightly basis. This upcoming February it is even hosting CBC’s "This Is That", a satirical comedy show featuring Pat Kelly and Peter Oldring! The streets in Cathedral Village are always busy, with functions going on many times throughout the year, such as the widely anticipated Cathedral Village Arts Festival and the Christmas Craft Market. While Cathedral Village is often overlooked as a place for tourists, the gorgeous area always has a new shop to discover and a new restaurant to visit. It’s the best place to experience the city if you are just passing through. What did you think of my list? Did I miss any places out? Let me know in the comments below, and don’t forget to share! All the images of Stone Hall Castle belong to Jason Hall, and the image of The Royal Saskatchewan Museum belongs to Wascana Centre because I apparently have never taken one of the outside of the building.